Against my wishes my daughter received an American Girl 18″ doll for her 5th birthday. Well those dolls need a lot of care. Especially when it comes to the hair. And for a 5 year old that’s not fun. She doesn’t want to spend time brushing out her dolls hair every time she plays with her. Or making sure she doesn’t put Grace away with a braid. She just wants to have a good time! So it got me to thinking. How do I make brushing Grace’s hair out fun? 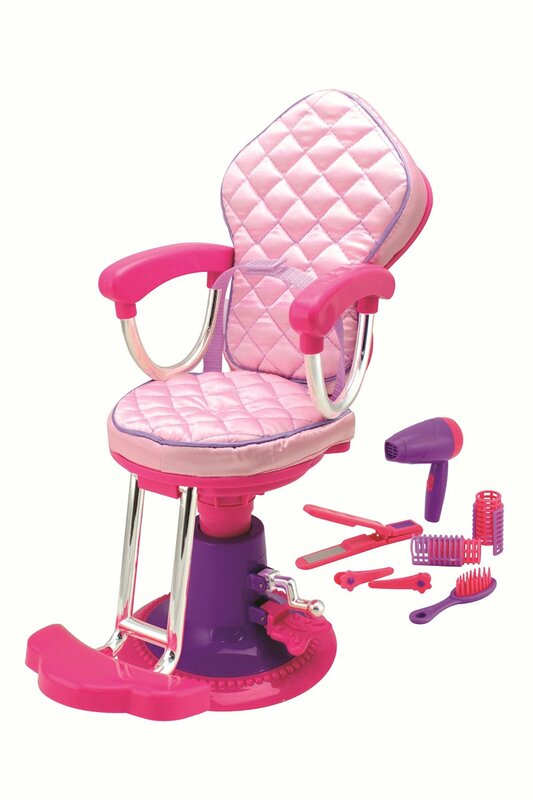 By getting a doll salon chair! The doll salon chair by Click n’ Play really is the perfect size. Peyton is able to place her American Girl doll or her Our Generation dolls in the chair with no issues. Then she actually wants to do their hair! Imagine that. Now I can get Peyton to actually take care of her dolls and she loves brushing their hair out. She even likes to do little updos and braids on them now. The doll salon chair also comes with a few accessories. Included is a hair brush, 2 hair clips, 2 hair curlers, hair dryer and straightening iron. Peyton can use all these to pretend she’s a real stylist and her dolls are her clients. She loves it! She even has a pretend sink where she pretends to wash their hair. I love listening to pretend. Another neat feature is the foot rest – it flips up and down! I love how there are little details just like a real salon chair. Now there was just one drawback I could find for this doll salon chair. There is some assembly required. But it really is not much. It did not take me long to have the chair put together and then my daughter was off. She loves her salon chair. You can purchase your own doll salon chair on amazon.